In 1997, I went to Israel for five weeks in November and December. For one of those weeks, I went to Eilat in the south of Israel on the Red Sea. The Red Sea is bordered by four countries: Egypt, Israel, Jordan, and Saudi Arabia. If you float in the sea at almost any point, you will be able to see all four countries as you spin around in the water. As it was, I was in Israel on the beach looking at the other three. One day on the way to the beach, I met a Dutch fellow, Jaap, and he suggested that we go to the Sinai for an afternoon of snorkeling. I spent the morning at the aquarium and then met up with Jaap to catch the bus to the Egyptian border. It was a relatively simple crossing, no visas to be paid, no interrogation, no line-ups. We passed through Israeli security and then walked the distance of no-man’s land to Egyptian customs. Of no great importance, Egypt was the only place in the Middle East that I had visited that had a bank machine that actually gave my card money. Jaap and I had coffee at the Hilton or whatever posh hotel it was. Coffee, in 35 degree Celsius weather, seemed strange to me, but then so are the Dutch and they love their coffee. After our lounging session, we headed to the beach in Taba and snorkeled for a few hours. We decided that for dinner we’d head to the Wild West-themed bar and have some Mexican food for dinner. We sat there eating nachos, listening to country and western, and watched the sun set over Saudi and Jordan. At that point I felt like I was so close, why couldn’t I just be there? How impossible would it be to go? Jaap and I finished dinner and made our way back through the borders, only to arrive after sundown on the Sabbath. No buses, had to find a cab back into the city. 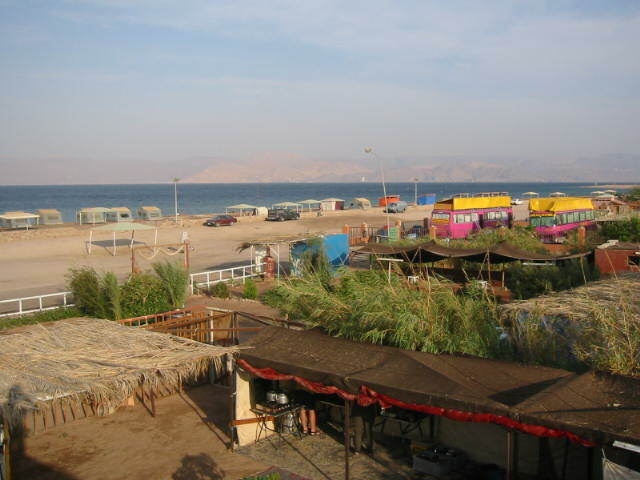 I thought that maybe I’d try and book one of those day tours from Eilat to Petra, Jordan, and check out the rose coloured city. However, for some reason and I think it had to be financial, I decided not to go. At that time I thought I was being a little crazy because how often did I head off to the Middle East? How often did one get so close to Petra and then pass it up? The only consolation I could give myself was that one day I might return. Until then, I’d continue wondering what Saudi was like and if I’d ever get there. Five years later, I was sitting on a beach on the Red Sea, this time in Jordan. After visiting Petra, finally, and the Wadi Rum where the sunsets were unbelievable and the desert was stunning, the group I was traveling with headed down to the Red Sea and parked the truck in a campground right on the beach. The snorkeling was not quite as good as the Israeli side, partly because of the amount of fire coral and the uncertainty as to where all the jellyfish were. At any rate, there we were, and this time, I was looking at Egypt, Israel, and Saudi from Jordan. This time, I was beside Saudi instead of across from it. As we had been driving through the country, we drove alongside the Dead Sea, and I was able to look across it to Masada where I had been five years previously. I remembered so clearly looking out from that mountain top to Jordan on the other side of the sea. What would it be like to be there? Would the sea look the same from the Jordanian side? Would the people be the same? How close the Jews and Arabs live to each other, separated by invisible lines, these lines that prevent us from easily crossing sides. And again, as we drove down the highway next to the sea, I was able to pick out other landmarks from where I had been before, but this time I could see those marks from another country and five years later. It was the oddest feeling – back then I had no idea what I’d be doing in 2002. I certainly never thought I’d be traveling the Middle East by truck with people I had only met just before we set out. I was only looking to the present at that time, where I was headed that afternoon, what I’d be doing that weekend. Now, as I was able to look at that experience from a new perspective, I realized that we really don’t know what is around the corner. How we get to these places, the people we meet, they are all part of the continuing line in our life, but it’s hard to think of it that way when we are so limited in our ability to see things in parts.